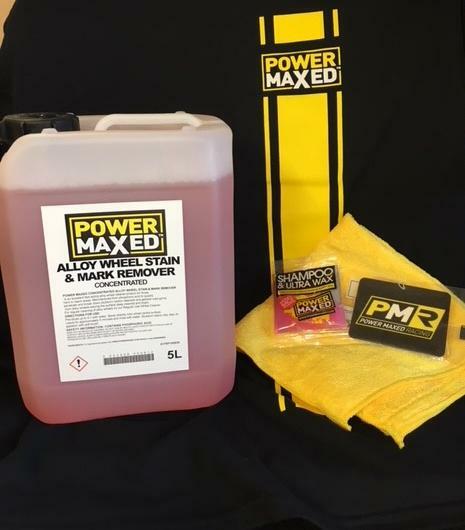 Power Maxed Alloy Wheel Stain/Mark Remover 5 litre + Free Complimentary Micro fibre Cloth and Shampoo & Ultra Wax Sachet. 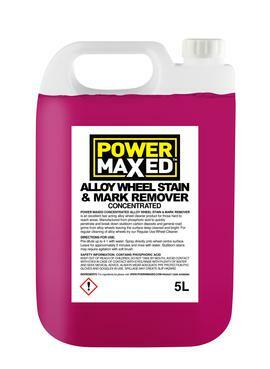 Power Maxed Alloy Wheel Stubborn Stain/Mark Remover is a fast acting alloy wheel cleaning product for areas that are difficult to reach. It removes carbon, tar, grease, road grime and stubborn ingrained dirt leaving the surface deep cleansed and bright. Power Maxed wheel cleaner has been designed to give the highest standard of finish and has been formulated in conjunction with some of the world's best race teams. For a milder formula with less acidity, try our Frequent Use Alloy Wheel Cleaner.